Are you ready to see one of the biggest bands of the 80s??? 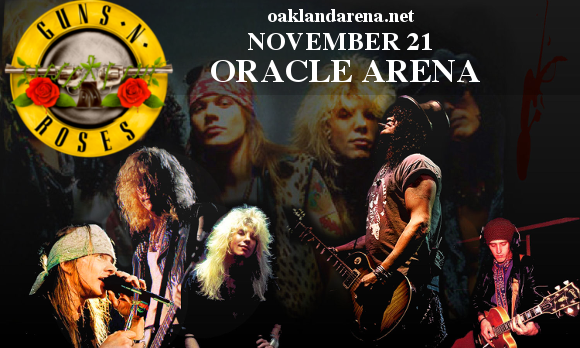 After shaping the sound of a generation, the legendary Guns n’ Roses are back and on tour!! They’re performing at the Oracle Arena on Tuesday 21st November 2017! Get ready for a once-in-a-lifetime experience any GnR fan would be mad to miss – hit the “Buy Tickets,” button NOW to be sure of your place! While tickets last only!! Formed of frontman Axl Rose, guitarists Slash and Izzy Stradlin, bassist Dugg McKagan, and Drummer Steven Adler, Guns n’ Roses’ first album, “Appetite For Destruction,” reached number 1 a year later, due to the popularity of “Sweet Child O’ Mine,” which topped the charts on the Billboard Hot 100. With sales of over 30 million copies worldwide, “Appetite For Destruction,” is the best-selling debut album of all time in the United States. From there, the band went on to release one top charting album after another, including “ G N' R Lies” and the twin albums “Use Your Illusion I” and “Use Your Illusion II”. Experimenting with many genres, Guns n’ Roses fuse punk rock, blues rock, and heavy metal, one of the first major bands of the 80s to blend styles in this way. Their influence on popular music has been massive, with artists from Aerosmith to Black Sabbath stating their admiration for the band, and many modern bands including Avenged Sevenfold, Fall Out Boy and the Manic Street Preachers citing them as sources of inspiration. Grab your tickets to see these legends while they last! !